Alciato at Glasgow: Emblem: In illaudata laudantes. Section: FORTUNA (Fortune, good or bad). View all emblems in this section. Tum primùm hostiles corripuisset equos. Bellua servasset ni nos foedissima barrus. Ut superasse iuvat: sic superasse pudet. Antiochus, in spite of his fears, had beyond all expectation routed the huge squadrons of Galatians with his light-armed troops, when the savage might of elephants, their raging and their trunks, for the first time ever fell upon the enemy’s cavalry. So when he set up the trophy, he adorned it with the picture of an elephant and furthermore said to his troops: ‘We would have fallen, if this revolting beast, the elephant, had not preserved us. Pleasing as it is to conquer, it is galling to conquer like this’. 1. For this incident, see Lucian, Zeuxis sive Antiochus 8-11. In 276 BC Antiochus I won against fearful odds by directing his sixteen elephants against the Galatian horsemen and scythed chariots. Not only did the horses turn in panic and cause chaos among their own infantry, but the elephants came on behind, tossing, goring and trampling. Although he had won an overwhelming victory, Antiochus did not consider it a matter for congratulation. 2. ‘Might of elephants’, lit. ‘might of Lucanian cattle’, supposedly so called by the Romans because they first saw these strange beasts in Lucania in south Italy, when King Pyrrhus of Epirus made use of them in his defeat of the Romans at the battle of Heraclea in 280 BC. See Pliny, Natural History 8.6.16. 3. 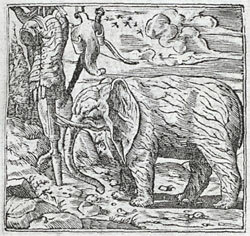 Some editions give dira proboscis, ‘their terrible trunk’. 4. ‘For the first time ever’. The Galatians, Celtic tribes who had invaded Asia Minor, had never seen elephants before. Elephants had often been used in battle on other occasions. Emblematum liber (28th February, 1531), Augsburg: IN ILLAUDATA LAUDANTES. Emblematum liber (6th April, 1531), Augsburg: IN ILLAUDATA LAUdantes. Emblematum liber (1534), Augsburg: IN ILLAUDATA LAUDANTES. Emblematum libellus (1534), Paris: In illaudata laudantes. Livret des emblemes (1536), Paris: In illaudata laudantes. Louer ce que est de vergoigne. Les Emblemes (1539), Paris: In illaudata laudantes. Louer ce que est de vergoigne. Les Emblemes (1542), Paris: In illaudata laudantes. Louer ce que est de vergoigne. Emblematum libellus (1542), Paris: In illaudata laudantes. Loben, das lob nit wirdig. Los Emblemas (1549), Lyon: Que no se à de loar lo que loor no mereze. Emblemes (1549), Lyons: Louange non louable. Emblemata (1551), Lyon: In illaudata laudantes. Diverse imprese (1551), Lyon: In coloro, che lodano le cose, che non meritano laude. Emblematum libri II (Stockhamer) (1556), Lyon: In illaudata laudantes. Toutes les emblemes (1558), Lyon: Louange non louable. Liber emblematum ... Kunstbuch (1567), Franckfurt am Main: In illaudata laudantes. Von denen so heßliche ding loben. Emblemata / Les emblemes (1584), Paris: In illaudata laudantes. Contre ceux qui louent choses non louables. Emblemata (1591), Leiden: In illaudata laudantes. Declaracion magistral sobre las Emblemas de Andres Alciato (1615), Najera: IN ILLAUDATA LAUDANTES. Les emblemes (1615), Geneva/Cologny: Louer ce qui n'est à louër. Emblemata (1621), Padua: In illaudata laudantes.